A crash between a semi truck and a tour bus that was taking more than 30 passengers to Yakima, Wash. left more than a dozen people hurt early Tuesday morning, January 14, 2014. 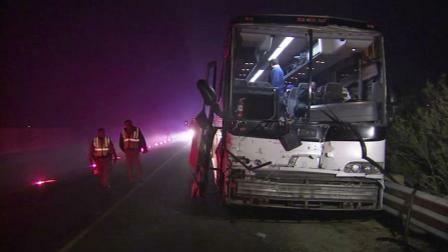 According to news reports, the bus was headed to Yakima, Wash. and departed from Los Angeles. The accident happened around midnight on Highway 99 in Tulare, CA. Local reports indicate that the driver of the semi-truck suddenly hit his breaks and was rear ended by the tour bus. More than 30 people were on board the tour bus and sixteen of the thirty were taken to the hospital to get their injuries further examined. California Highway Patrol (CHP) officials stated that the bus was traveling at too high of a speed and was unable to slow down and react to the semi-truck changing speeds. The tour bus ended up on the median while the semi-truck came to a stop about 50 yards away. The bus’ front bumper was smashed in and window was broken due to the impact. It was reported that most of the people on the tour bus were asleep and awoken by the collision. 36 people were on the bus including three children. Fortunately for everyone involved in the crash the impact didn’t cause more damages. Officer Scott Harris with the California Highway Patrol said, "Luckily the impact wasn't really really bad. I'm sure once the bus came to a stop that's when things went downhill, but luckily for everyone in the vehicle it wasn't that severe." The cause of the initial sudden stop from the vehicle in front of the tour bus is under investigation. The driver could potentially be cited multiple tickets. Weather cannot play a factor into this crash because there was no fog at the time of the incident. The tour bus is owned by Fronteras Del Norte, which is an employment-related transportation company that was founded in 1991. The company’s mission is to cater to Hispanics traveling from California to Oregon and Washington. According to the company website, Fronteras Del Norte is a family-owned business that aims to provide safe and reliable transportation for those seeking work in agriculture in the farm fields of Washington and Oregon. The company had no comment following the news of the crash.